October contents: Blemishes on produce do not necessarily mean it's organic!.....Fruit production depends on pollinators......In praise of autumn raspberries, and my special way of pruning them for the best crops.....This time of year is a non-stop fruit fest!..... 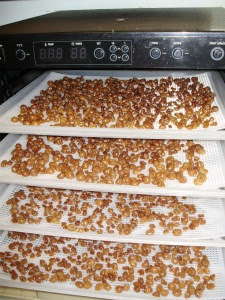 Dehydrating is a good way to preserve some fruits.....Time to think about planting bare-root fruit trees and bushes......What rootstocks are best for apples?... Do you homework first!....Choosing varieties. Blemishes on produce do not necessarily mean it's organic! Joni Mitchell's song 'Big Yellow Taxi' has a lot to answer for! - Much as I love that song ( it's often one of my party pieces as an enthusiastic singer!) - it did rather give the impression that to be really organic - apples or any other fruit must have blemishes to prove it - which is total rubbish! It doesn't - and blemishes are NOT proof that something is either certified organic, or even chemical-free! It's usually proof that whatever it is - be it apple, pear, strawberry or whatever - is perhaps the wrong variety, possibly being grown in the wrong climate, probably grown on the wrong rootstock in some cases, and also in the wrong way! We're often told that modern apples have been bred for flavour and disease-resistance, but I find many of them far too sweet and insipid - often with very tough skins. Most have been bred for ease of harvest, uniform size, cosmetic perfection, an ability to travel and be packaged conveniently in supermarkets packs without bruising, and longer shelf life! - Absolutely none of those are qualities which impart flavour or healthy nutrients! 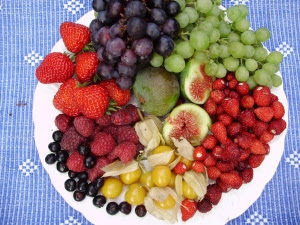 Although those who say that only the most ancient ancestors of fruits have the nutrients we need are also wrong - but that is a theory widely propagated by many Paleo diet eaters or writers who know nothing whatsoever about growing fruit! There are a few, relatively recently-bred and notable exceptions, which sadly one doesn't tend to find in shops. So the only way to taste these or the older varieties is to grow your own! Although many old varieties have been lost through lack of cultivation - the wonderful (and cosmetically perfect!) heritage apples pictured above - Court Pendu Plat, Old Pearmain and Ashmead's Kernal are just three of the many scrumptious and nutrient-rich old varieties still available from nurseries which should be far more widely known and cultivated - and which I grow here. All of them keep until well after Christmas, and will produce perfect crisp fruits, with aromatic and deliciously complex individual flavours - if they are cultivated on the right soil, on the right rootstock, and in the right way! There are a lot of misconceptions out there about organic growing, and it's very sad that so many people seem to think that organic fruit or any other produce can't be perfect - but public perception is everything it seems. Proof of that are the 'Smart Alecs' I often still come across on my occasional farmer's market forays, who, when asked if their produce is organic, say "of course it is - can't you see the dirt on it and the bit of carrot root fly damage?" - I really despair sometimes! When I was supplying supermarkets, the Dublin Food Coop and running my box scheme (the first in Dublin in the early 1980s) - I would have been ashamed of dirty and damaged produce! Why do people still think that being so proves that produce is organic? As I've often mentioned - if you're in any doubt that the produce being displayed may be organic or not, and the seller isn't displaying their certificate with it's certification number on it - which they should be proud to - then ask them to prove it by providing their certification number and the name of their certifying body - before you buy the produce! Unless you are buying seconds, at a reduced price, then there is no reason for any organic produce to have any blemishes or damage, if the grower is proficient at their job! .Rant over!! Most fruit is pretty easy to grow and very rewarding if you choose the right varieties for your particular area of the country and it's climate, your particular local soil and your garden's micro- climate. Every garden is different. It's all about doing your homework first and planning and then finding out what to do when - and these days that's easy to do with so much information online.The first thing to do is to find out exactly what type of soil you have - for instance either heavy clay or free draining, and your local climate. Then look at your garden. See which way it faces, where the sun comes from for how long, whether it's windy or if there are any frost pockets in colder weather. Then look up suitable varieties of whatever type of fruit you want to grow that will suit your conditions. Then you have the exciting task of choosing your varieties - tha's the bit I love most - and still find it addictive even after over 40 years of growing! Fruit nursery catalogues are a mine of free information - but don't forget that some of the bigger ones that are perhaps tied to seed catalogues will tell you that everything is marvelous! I've been caught out a few times by buying something that sounded wonderful which turned out to not to be! So it pays to be a bit sceptical and double, or even triple check on the variety you want. Fruit trees like apples, pears or plums in particular are a long term investment. If you choose well and take time to do your homework - it will pay off in spades. You may find for instance that only one catalogue may helpfully tell you that the particular variety you are looking up is suitable for northern gardens. The others may say nothing - leading you to believe that all varieties are suitable for all areas of the country. They're not! 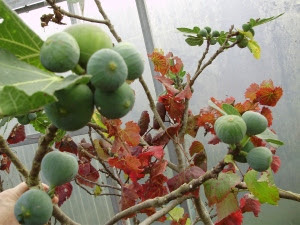 A tree suitable for Northern gardens will tolerate both cold and wet with ease - but something like a Cox's Orange Pippin for instance will never do really well here in my part of Ireland unless in a very warm, well drained soil in a sunny walled-garden. It's far happier in the south-east of England where it will get those conditions, but there are plenty of other varieties just or almost as good, which are diseased-resistant and productive. The same goes for the rootstocks which the variety of tree is grafted onto. Many nurseries may tell you that an M9 rootstock will produce earlier crops - but what they won't tell you is that the tree will need staking all it's life otherwise it will fall over when it's carrying a heavy crop, and will ultimately never produce the volume of crop that trees grafted onto an M26 or MM106 rootstock will. Homework pays off. I never thought I'd say that when I was at school! But then it was rarely about my favourite topic - fruit! And of course if you want good crops of fruit - the next thing you have to take care of are the bees and other pollinators we depend on to pollinate the flowers - or you won't have any fruit! It seems a long time since spring and bees busily pollinating the peach trees - what a crop we had again thanks to them! Fruit production depends on Pollinators! One of the many reasons I try to attract bees, butterflies and hoverflies into my garden, tunnels and orchards, by growing lots of single flowers for them all year round - is that pollinators and bees in particular, are vitally important to us. They pollinate almost all of our fruits. Without them there would be few of the most delicious and healthy foods we can eat! There would be no apples, pears, plums, blackcurrants, luscious peaches, apricots, raspberries, blueberries, strawberries, cape gooseberries, blackberries or even almonds. The list of food crops they pollinate are almost limitless, and while doing that they also produce fabulous honey. Not only would our diets be a lot more boring without them - but they would also be a lot less healthy. We can help bees by growing suitable flowers for them all year round and by not using pesticides. We depend on bees so much than many people realise. They pollinate a huge amount of our food and yet they are being increasingly threatened by pesticides, a lack of habitat and a lack of uncontaminated wild food sources. They can't just buzz off and exist without any healthy food until we want them to appear again when it happens to suit us - and conveniently pollinate all our crops! They are increasingly under threat and I simply cannot understand how so many farmers fail to think about what would happen if there were no bees to pollinate rapeseed, flax, sunflowers and so many other of the seed crops that we grow as well as our fruit. A few farmers are now growing wildflower margins in some fields because they get grants to do that. But while it may all look very impressive - it's no good if you're attracting the wonderful bees with nectar-rich flowers - only then to just poison them with pesticides in treated crops right beside them! Indeed there is also evidence now that even the wildflower margins are often actually contaminated by pesticides like neonicotinoids which are lethal to bees - and also weedkillers like Glyphosate - which is hugely damaging to all of the above and below ground biodiversity that we rely on for our own healthy food. There is scientific evidence now that are both carried over from one year to the next in contaminated soil - despite the fact that the makers predictably say that they are not! Looking back in my diaries - this time three years ago the ground was littered with raspberries in the fruit garden after a severe storm which did a lot of damage everywhere in the garden. The autumn raspberries were just carrying a really huge crop, and it was so sad to see so much fruit lying around wasted the next day. The same happened again last year with Storm Ophelia and this year with even more storms. We live on a very windy hill - often with wind coming from different directions on successive days and our autumn is often very wet too. So a few years ago - I decided to experiment with growing my favourite variety 'Joan J' - pictured on the left here - in large,10 inch pots of peat-free compost in my fruit polytunnel. I'm happy to say it's been a huge success, with plenty picked every day from just 10 potted plants on grow bag trays. They're a long way from finished yet too - there's still a lot more flower buds on the canes and we may yet still be picking raspberries at Christmas - as we have done for a couple of years. After the autumn crop is finished - pruning is what most people think about - and many years ago, quite by accident, I discovered a new way of pruning them! If you prune your autumn raspberries my way - leaving some of this autumn's newly fruited canes to continue to grow the next year, rather than cutting them out completely as recommended - those canes will actually fruit again in early summer the following year, slightly lower down on the canes! After those canes have finished producing their second crop - only then do you cut those twice-fruited canes right down to the ground. I prune all of my autumn raspberries this way now - only cutting down half the canes in spring, and feeding the plants well. It works perfectly with all of them. I really don't understand why so many of the fruit 'experts' are still recommending cutting them all right to the base in winter or early spring. It's a waste of potential fruit and means that the plants probably only produce about 2/3 of the crop which they potentially could! It's amazing what you find out by chance sometimes - or by not having time to prune at the recommended 'right time'! Autumn raspberries are always reliable croppers and even if they're relatively neglected, they'll go on cropping far longer than any of the summer varieties. If I only had a small garden - I would definitely grow autumn varieties rather than summer ones. They give you twice the value from the same space! All of the autumn varieties are incredibly vigorous though - especially the older ones, and some can become a bit of an invasive nuisance in a small garden where space is at a premium. If you're prepared to feed and water regularly though - it's possible get very good crops from large pots or tubs and even to lengthen the season by growing some in the sunnier spots in the garden and others in a more shady place. This has the effect of holding the shaded ones back by a couple of weeks. This is how the gardeners in the great old country houses of the past used to lengthen the season of many fruits - they were masters at producing fruit and vegetables over as long a season as possible, their methods were often fascinating and many are still worth copying today. Growing fruit in pots in our modern polytunnels lengthens the season even more. I've tried many different varieties of autumn raspberries over the years - and I think the best two are still currently Joan J and Brice. Both are equally good. If you want a good yellow one - Fall Gold is very tasty, with large berries and that again will also fruit twice a year if it's pruned my way. This year I'm trying a new variety which is looking incredibly promising and has an even better flavour - I'm not revealing it's name yet until I'm sure that it's thoroughly reliable - so watch this space! This time of year is a non-stop 'Fruit Fest'! Pictured here are just some of the 'soft' fruits which you could be eating from your garden in October, as well as orchard fruits like apples, pears etc. I like to have as big a range as possible all year round as I don't buy any. At the top of the picture is the authentic 'Black Hamburgh' grape - grown from a cutting from the original vine in Hampton Court Palace (no - not what you're thinking - wouldn't dream of it!!). Some years ago they were restoring the glasshouse which it grows in at Hampton Court, and they propagated some for sale at Hampton Court flower show, to help pay for the restoration. Clockwise next to that is grape Muscat of Alexandria - the berries would be bigger if thinned - but my life really is too short to thin grapes!) then a large fruited alpine strawberry 'Reugen', physalis (cape gooseberry), blueberries 'Darrow' and 'Brigitta Blue', raspberries 'Brice' and 'Joan J', strawberries 'Albion' and 'Everest' and an unknown fig in the middle, that has a heavenly honeyed flavour! Figs are one of my passions - I've lost count of how many I grow at this stage - I must do a head count - but I think I have about 15 or so varieties now as I treated myself to two new ones recently. They grow really well and fruit best in large pots, so even the smallest garden could grow one. Brown Turkey is the most easily available and also one of the most reliable outside in a sunny spot. Under glass or polythene you can grow the more tender varieties like Sultane - which will crop twice in most years, in May/June and again in September/October. Most people associate this time of year mainly with orchard fruits but as you can see - despite the fact that it's late-October there's still a huge range of other fruit that you can be eating now from the garden or polytunnel - quite apart from apples, pears and plums. Experts have been stressing for some time how important it is to get at least 'five-a-day'portions of fruit and vegetables. In addition to vegetables and other fruits - berries of every sort, either fresh or frozen are a vitally important part of a healthy diet. Now scientists say say that eight portions a day - or even more - is good, and that the more fresh fruit and veg you can eat the better. This is because all fruits contain a huge range of health-protecting phytonutrients like the polyphenols, flavonoids and anthocyanins. So it makes even more sense to grow your own organically - particularly when you hear about non-organic imported soft fruit possibly being sprayed with antibiotics like streptomycin - which some people are allergic to. Of course this will never be declared on the pack - in the same way that no other chemicals are! This is something you can do with most fruits and lots of other things too. Blackberries are no good for dehydrating as they are horribly 'pippy' when dehydrated, but it works a treat with the grape Lamemont seedless which you can see in the picture here. They are absolute heaven dipped while still frozen, into some hot and deliciously runny baked Camembert or Brie - as I mentioned a few days ago on Twitter to some grape growers in the USA! Irish organically-grown sultanas - who would believe it! Celebrity chefs please take note - if you're interested in buying these, they would cost at least 10 cent per sultana - but given the prices most still charge in their fancy restaurants even after the Celtic Tiger - I guess they could still afford them!! 6 lbs 8oz/ 2.95kg of seedless grapes reduced down to an intensely-flavoured 1lb 10oz/740gm! My son says they're such a luxury item that they should be covered with edible gold leaf in order to do them justice! They really are the most delectable thing in creation when semi-dried, but still slightly chewy. Grape sweeties! I'm going to have to put a lock on the freezer! Just like the Rosada baby plum tomatoes - they're so high in natural sugars when semi-dried that they don't freeze solid, which means that they are far too deliciously edible straight from the freezer - just as they are! Loose-freezing dehydrated berries is a great way of reducing the amount of space that fruit takes up in the freezer - and space is always at a premium at this time of year. We don't tend to eat much jam in this house - and there's only so much fruit you can actually eat fresh, so dehydrating is a very good alternative because this way, fruit takes up far less space. Everything usually dehydrates down to less that a quarter of it's original volume. 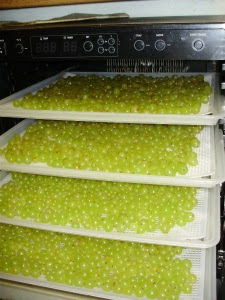 Here you can see the grapes after dehydrating overnight! My precious sultanas don't get buried anonymously in cakes though, except in the case of very special ones - they're way too tasty for that! They're used on top of breakfast muesli, on salads, as garnishes, dipped in melted dark chocolate (only healthy 75% plus naturally!) or re-hydrated in a desert wine to go with home made pates at Christmas, or perhaps with some ripe 'Stinking Bishop'- the legendary soft cheese of 'Wallace & Gromit' fame from artisan cheese maker Charles Martell - who sadly doesn't do mail order but who conveniently just happens to farm very close to my cousin in Herefordshire! The Little Milk Company organic Irish Brie is a good alternative here in Ireland though - when really ripe. Fruity preserves, especially fruit cheeses, which are more like thick 'cuttable' jellies - rather like quince paste, are also lovely with all manner of rich pates, cheeses, cold meats and game, and are sold for that purpose in very up-market cheese shops. I made some great damson cheese a few years ago which was delicious with my duck pate. Just the right amount of tart, mouthwatering 'fruitiness' to contrast with the rich fattiness of the duck liver. It went down extremely well at my midwinter solstice party that year. Someone called in to LMFM Radio, after our 'Tips from the Tunnel' show a couple of years ago and said it was more like the 'Gerry Kelly eating' show! They were so right - we tend to munch our way round the tunnels trying everything! That's the truly great thing about growing your own. I could never buy most of the things that I grow in my garden from shops even if I wanted to. I love trying to grow all sorts of unusual fruits as well as the more normal ones - and I love eating them too! After opening up the polytunnels most mornings I've had at least 3 of my '5 a day' before I even get near the breakfast table! Autumn is the best time to get bare-root fruit trees or bushes of all types planted - while the still is still relatively warm they'll get a head start, and if the winter is another wet one or we get deep snow like this year - it may be your only chance to plant until well into next spring! If you've ordered any fruit, now is a good time to prepare the planting sites properly before the soil gets too wet. Dig over the soil well to improve it - you can't do no-dig here unless you have exceptionally good soil to start with. No fruit appreciates poor drainage, so you must prepare your planting site really well. For a young bare root tree - a single whip maiden tree (in other words a single stem with no side branches or just one or two very small ones) - I would prepare an area of about a metre or so square, gradually tapering my preparations into the surrounding soil so that it all seamlessly blends in. This may seem quite a lot of trouble to go to - but when you think that the tree will last for at least your lifetime and hopefully give you good crops every year - then it's well worth it. I started off with very badly degraded soil which was more akin to sub-soil - so believe me I'm speaking from experience when I say that preparing ground properly really pays off! If I'm planting into new ground that has a covering of grass - I first strip off the top layer of grass, about the top 2-3 ins including the roots - over an area of about a metre for a small fruit tree. Then I set that to one side, dig out the top layer of soil, about 30-40cm, depending on the depth of the top soil, breaking it up as I go. You can see where top soil ends - the sub-soil is usually slightly lighter in colour as it's either less full or totally devoid of humus - although in many badly degraded soils on industrially farmed land, the topsoil and subsoil look exactly the same - as ours did when we first moved here! I then fork the bottom - pushing the fork in as far as possible several times around the base of the hole, wriggling it around a bit just to loosen it - without turning over the compacted sub-soil, so that roots will be able to penetrate down more deeply. When preparing the planting hole I also scatter a couple of very small handfuls of bonemeal over the entire area (which supplies phosphates) and also some seaweed meal (which supplies potash, soil-conditioning alginates and trace elements). These also encourage good root development, fruit bud formation and also stimulate biological activity in the soil. The microbial life in soil can be damaged by chemicals such as pesticides, artificial fertilisers and weedkillers and can take a while to recover - so it needs all the help it can get. Despite the manufacturer's claims - chemicals do kill soil life as I mentioned earlier this year, and also run off into the ground water killing a wide range of aquatic life too, including frogs. A well-fed and vitally alive organic soil, full of all of it's proper soil microorganisms and bacteria shouldn't need such additions - but if you're starting off on a new allotment site - particularly on possibly former agricultural land, then it definitely would. Anyway - the more help your tree has to get established quickly the better - particularly in our now uncertain climate. You'll only have the chance to do this once - so better to be safe than sorry and prepare your planting site really well. I can guarantee that it will pay off. It's a good idea to do a pH.test before you start too - if you don't already know the pH of your soil, as lack of calcium (lime) or poor calcium transport due to poor drainage and water-logging can cause bitter pit in apples. This looks like little black dots in the skin, penetrating just slightly into the flesh, which don't affect the flavour but mean that they won't keep well. If your soil is 5.8 or less - then it will definitely need some lime. I like to use Dolomite lime or calcified seaweed - which are more slowly released and gentler than ordinary garden lime. These also supply other trace minerals. Or conversely, you may be planting something like blueberries which need an acid soil - in which case do the pH test before you buy them unless you're prepared to grow them in containers, which I think is too much faffing around unless you're prepared to always water with rainwater. Most tap water has far too high a pH. Next I put the turves of grass I've stripped off, grass side down in the hole, replace some of the topsoil mixed with only a very small amount of good homemade compost to provide microorganisms like beneficial bacteria and fungi. As my soil is also very heavy clay, I also fork in a fair amount of pea gravel or grit over an area of about 5-6 times the width of the hole dug for the tree. This gives good permanent drainage - whereas compost will gradually disappear over the course of a few years. When it does the ground can sink and create a 'sump'. You may not have to use pea gravel if you're soil is reasonably well-drained. Always plant higher rather than lower to prevent a sump forming as the ground settles - and never use a lot of compost or manure which can promote soft sappy disease-prone growth. Also at this point I then place the tree or bush on top of this mix and sprinkle some beneficial micorrhizae powder like 'Rootgrow' directly onto the roots. Research has shown that doing this really 'supercharges' the roots - encouraging them to make a lot more roots quickly which will reach further and the micorrhizhal powder also provides fungi which grow and form fungal threads - attaching to the roots and helping the tree to forage much further for nutrients to feed the tree and for water too. These beneficial microorganisms help to kick start the soil life, which firstly helps tree roots to establish and they also establish an ongoing symbiosis that enables trees to produce those healthy phytochemical compounds that both protect the trees from pests and diseases and which are also healthy for us. 'RootGrow' available now in most garden centres. You can buy it in small packets which will treat about 6 trees - or in larger amounts which works out better value. These supplements of micorrhizae are not cheap - but I think they're definitely worth it. Any trees that I've used them on have always established amazingly fast and well. After I've sprinkled the powder directly onto the roots, I then work more of the topsoil/compost mix gently around them. It's vitally important not to overdo the compost in holes when planting trees as this has been show to discourage roots from foraging any further - this is particularly the case with container-grown trees, which I'm generally not keen on - although some potted in non-peat based composts are good. Container-grown trees from garden centres and nurseries have often sadly also been ignorantly planted with the root stock far too close to the top of the compost - or even buried altogether - which can cause endless problems and also negate any dwarfing effect of the root stock. For this reason you must make sure that the root stock is at least 4 inches/10cm above the eventual finished surface of the soil! Measure the depth before you start, by putting a bamboo cane or piece of wood across the hole after digging the hole, allow for a little bit of sinkage that will happen as soil settles - and then constantly check the depth as you fill it back in. Then firm lightly. Planting this way will leave a very slight mound which will settle just a bit gradually when firmed after planting. and it's no harm anyway as it helps water to drain away. Never plant anything into a hole lower than the surrounding area. Common sense, particularly in our increasingly wet climate - as apple trees don't grow in ponds!. If I'm preparing the hole in advance - I then cover the entire planting area with something waterproof to keep rain out and the weeds down, while I'm waiting for the plants or trees to arrive. This may seem like an awful lot of bother - but believe me good preparation will ensure rich rewards for many years to come! Preparing the planting sites in advance in this way means that you're not delayed by unpredictable weather and can put plants in as soon as they arrive - even in bad weather. What Rootstocks are best for Apples? Do your homework first! I've talked about root stocks for Apple trees before - so all I'll repeat is that MM106 and M26 are without question the best semi-dwarfing rootstocks for healthy apple trees in our climate here in Ireland and in most of the UK too. They eventually grow to about 12-15ft, after 8-10 years, but can easily be pruned (particularly M26) to keep them small enough for training as smaller bush trees, spindles or even as cordons. The only exception to this are what is known as the 'triploid' varieties like Blenheim Orange, Bramley's Seedling, Jupiter, Ashmead's Kernal and Holstein Cox, which tend to be much more vigorous and are not really suitable for training as espaliers or cordons, unless you want to spend your entire time pruning! Triploid is a bit of a technical term - but all you need to know is that a triploid is usually very vigorous, produces no good pollen of it's own and will not cross-pollinate other trees. It also needs two other compatible pollinating trees which are flowering at the same time - in order to produce fruit itself. Good nursery catalogues give lists of which varieties are compatible with each tree. Unlike the smaller more dwarfing root stocks, MM106 and M26 don't need staking after the first year or so once established. More dwarfing rootstocks such as M9 and Coronet will give you a few fruits a little bit sooner - perhaps only a year - but far smaller crops eventually than the others. In my experience they are a complete disaster in our wet climate here - unless they're in very well drained spot. Even then trees the tree need to be permanently staked and never seem to be really healthy on them. The rootstock doesn't just dictate the size, but also the health and vigour of the tree as I mention later. As Jorrocks used to say about a horse's soundness a couple of centuries ago - "No foot - no 'oss!" - the same goes for fruit trees. No roots - no tree - for want of inventing a better quote! As the root stock affects the vigour of the tree - they naturally affect it's health also. Both MM106 and M26 root stocks will give you the healthiest trees. In addition - the specific variety which is grafted on to that rootstock also naturally has an effect on that. If you're planting a variety that's particularly susceptible to a disease like scab or canker in our damp climate - then it's possibly still going to be somewhat susceptible, no matter what rootstock it's on - but preparing the planting site properly and making sure it's well-drained, will go a long way to helping to prevent disease! To use another 'horsey' analogy too - always ask the garden centre what root stock their trees are on - NEVER tell them what you want - or they may say that's exactly what they are! If the tree doesn't have the particular root stock clearly printed on the label - if they're honest, the garden centre will say they don't know and in that case you can ask them to find out. But still don't tell them what you want. An apple tree is not cheap, it is a very long term investment. Don't just get palmed off with any old thing or you will be sorry - but you may not discover your mistake for several years! Again I speak from extremely bitter experience of wasting years by planting one or two trees which with hindsight were definitely NOT on M26 rootsocks - but clearly on an M9! About 5-6 years after planting, when carrying a sizable crop - they both keeled over in autumn gales. Not an experience I would ever want to repeat! I think in general it's much better to go to specialist nurseries who have good catalogues - although one or two nurseries, like Johnstown Garden Centre here buy from a very good UK supplier and also have their catalogue for you to choose from, if you make up your mind in late summer/early autumn. If you're buying from a catalogue - then look for varieties that do well on your type of soil, in your particular climate and on the right rootstock. That's particularly important here in Ireland with our often wet climate - and with weather predicted to become wetter with global warming/climate change then it's something we all need to think about. Next, you also need to ensure that they will pollinate each other - unless you have plenty of apple trees nearby in other gardens. A lot of garden centres sell totally unsuitable varieties like Golden Delicious or Cox's just because that's what people see in supermarkets and so are the only names they know to ask for. Varieties like those are only truly happy and productive in a dry, warm climate somewhere like Kent, the south east of the UK or further afield in Europe. You may get a few apples from a Cox tree here in a very warm spot on warm, well-drained soil - but if you've only got a small garden why give space to a tree that's at best only going to produce a few miserable scabby apples? A much better alternative is 'Queen Cox' or Holstein Cox) which have exactly the same fantastic flavour, apples 3 or 4 times as big and are very heavy croppers if you have other suitable pollinators (Discovery, James Grieve and Grenadier are good) or if there are apple trees close by in other gardens. Remember that Holstein is a triploid though and must have two other pollinators. It is not suitable for strict training. They can both make lovely bush-shaped trees though, up to 15ft/3m high and wide if kept under reasonable control, and are hugely productive with fruit that keeps for months, until well after Christmas. I've given Holstein to several friends over the years as a present if they have large gardens, and they all love it. Bare root trees are definitely by far the best buy in the long run. It doesn't take nearly as long as you think it might to get fruit, even if you're planting what's known as a first year maiden whip (a single stick on roots in other words). These will start to fruit in their third year and is not only the cheapest but by far the best way to buy apple trees. That way you can be sure that not only are they on the exact root stock that you want (from reputable nurseries) but also - as I've said before - they will establish more quickly and far better than anything with it's roots going round in circles in a container - and they're much cheaper too. Often half the price. It's a no brainer! Containerised trees often take several years to settle down and while you might get a few fruit immediately from planting a containerised tree - they will never establish quite as well and be as good as a bare-root planted tree and may need staking all their life - this is particularly the case if they were growing in an unsuitable peat-based compost. In that case I would wait until the tree is dormant and then shake as much of the compost off the roots as possible without damaging them - then spread them out and plant it in a similar way as I've described above. If you compare a 3 year old container tree and a tree that has been planted as a bare root 1 or 2 year old, in about 5 years time, I can guarantee that the bare root one will win hands down in terms of development and cropping! If you haven't already got a few catalogues - get them fast! Many of the good nurseries have pre-season offers right now. Popular varieties sell out very quickly, so order as soon as possible. Good catalogues are a great free source of expert information and increasingly nurseries are selling wonderful old heritage varieties. In addition the good ones also tell you what regional climate they are suitable for. Deacon's Nursery on the Isle of Wight is a terrific catalogue. - although for some reason they seem more expensive than many to send to Southern Ireland by mail order - but if you have a friend in the North - you can offer them some future fruit in return for taking delivery of your precious trees. I've done that several times. There's not much I wouldn't do to get my hands on new or tasty fruit varieties as you've probably guessed by now! (It's a bit like stamp collecting - it's addictive!) Some nurseries will only send to UK addresses - so that gets round that problem too. R.V.Roger, of Yorkshire have the best range of blueberries I've seen - including 'Darrow' which I have and think is the best tasting ever - with huge tasty berries. Ken Muir's are great for strawberries, grapes and most other fruits - definitely the best quality plants by mail order I've ever bought (they have Albion strawberry - a brilliant perpetual variety) Dobies are good too - but a smaller range though. These are nurseries that I personally have experience of - but there are many more. The range is sadly more limited from most Irish nurseries and many are still propagating apples on M9 root stocks which I would never buy again! They are a such disaster in our wet climate! At the risk of repeating myself - trees grafted onto M26 will fruit just as quickly, are far healthier and don't need permanent staking. MM106 is also good - especially if the variety being grafted onto the rootstock is a slightly weaker grower. It's just slightly more vigorous than M26 - but not hugely so, and also imparts good disease-resistance. There are masses of individual varieties of fruit trees available online, with many nurseries selling heritage trees. When you're buying those - you're buying historic varieties, preserving social history and genetic diversity too! Some of my apple varieties here go back at least as far as 1100 AD or earlier - and one pear that I have - The Black Pear of Worcester - is said to date back to the Romans, was taken on the Crusades and the 100 years war - due to it's long-keeping abilities, being hard and inedible for months until ripening, and has particular family connections for me, back to some of my ancestors. It fascinates me that like old roses, people have kept particular apple varieties going for hundreds of years! I always feel it's almost like holding the hand of someone going back over the centuries - because basically you're just touching the other end of the branch which that someone touched long ago! What an amazing continuous connection! How interesting to hear Monty Don quoting that in a recent Gardeners World in relation to roses - it's an expression I've often used here on my blog since 2010 - and one that my dear late father, a keen pomologist (fruit grower), often used! There are still plenty of Apple Days on at the moment around the UK and Ireland - so get out there and see the huge variety there is to choose from. You'll be amazed at their diversity - and equally amazed at their long and fascinating history! Dreaming again! Where was I?.. Ah yes- fruit!! As soon as the fruits in your fruit cage have finished producing for this year - take the top netting off to let the birds in so they clear up any pests that may be lurking. If it's fox-proof, you could even put your hens in there if you have any - they work wonders! They are the very best way of getting rid of gooseberry sawfly if you've had it - as speaking from experience you often may do on first year, bought-in plants. Gooseberries and blackberries also greatly appreciate the extra nitrogen in the hen's droppings - but don't leave them in there more than four weeks or so - or they'll 'sour' and acidify the soil too much. It's wise to take off the top netting just in case we get snow too - (I hope not again!) - or the weight of it can actually collapse the whole fruit cage! Make sure you take long enough now to really enjoy all the wonderful riches that Nature offers from the fruit garden at this time of year. It's a feast for the eyes as well - there are potential 'still life' paintings everywhere one looks. I'm always longing to get my paintbrushes out, but never seem to have the time these days. Everywhere I look there is luscious beauty just waiting to be captured in paint forever. Somehow photos don't really have that almost tactile - 'certain something'. Maybe a painting enhances the 'essence' or personality of something in the same way that a really good sculpture does? After all the fruit harvest is gathered - I have to content myself with picking a beautiful daily apple out of my rather unconventional old freezer fruit store! The scent of ripening apples when I open the door is simply incredible. Or I help myself to some of the delicious semi-dehydrated frozen peaches! I do wish you could smell them - it's pure aromatherapy!